Have your kids ever wondered where the eggs on their dinner plates come from? Now they can find out the fun way: by playing Pocket Egg Race. Developed by urbn; pockets, Pocket Egg Race is a unique board game about the production of eggs. Kids can play alone or against a friend to complete various mini games that illustrate an egg’s journey from the farm to their homes. To play, kids first create avatars. This process involves tapping on the screen to hatch a chick, naming it, and then selecting a hat for it to wear. Kids can also record a voiceover for their chicks. Once the avatars are made, it’s time to play. In two-player mode, kids take turn spinning an egg in lieu of a dice to determine how many spaces they can move forward (or backwards, depending on their luck). The solo mode uses the same board, however the player travels along the game path without stopping. As kids move along the game path, occasionally they’ll land on special flowers. These flowers trigger mini games, which have been designed to help kids practice various skills: hand-eye coordination, fine motor, memory, problem solving, and even counting. 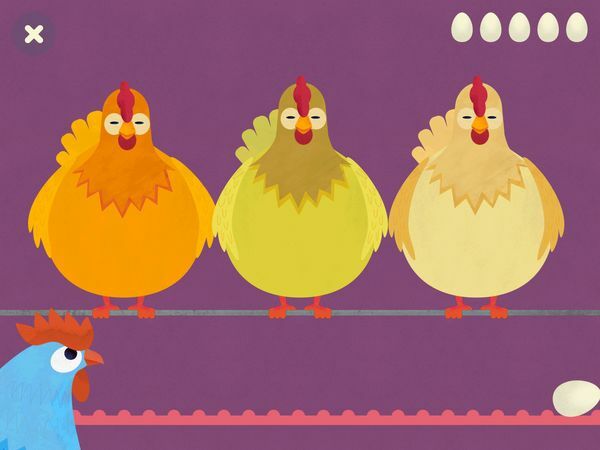 For example, there is one game where kids are tasked to memorize sequences to get a group of hens to lay eggs. In another game, they rearrange puzzle tiles to build an egg processing machine. Additionally, some of the games make good use of the iPad’s hardware. One game, for example, requires kids to physically balance their iPad as they carry an egg on a spoon. There is also a game where kids navigate an egg through a maze à la Marble Math. For each game activity, kids are rewarded with stars based on their performance. The fewer mistakes they made, the more stars they will receive. If kids can finish a game perfectly, they will earn two stars and be able to move forward one space in the game. As with most board games, the game ends when a player reaches the final space. Players can then decide to play again from the beginning. It is worth noting that players can also quit playing any time, and then continue where they left off. To resume a game, simply tap on the Resume icon (the one on the left) on the main screen. Pocket Egg Race contains 10 activities to hone a diverse set of skills. Some of these activities are on the simpler side, such as tapping to catch worms in Whack-a-mole style. Others are slightly more complex and more suited for older kids (ages 6–8), such as finding the right stack of cartons that will fit into the space on the shelf. That said, I would say kids as young as three years old will be able to play with some help from adults. The app also shows a quick tutorial before each mini game to show kids what needs to be done. If a game feels too difficult, it is always possible to skip it by tapping on the X on top right-hand corner. One thing to keep in mind is to schedule enough time to play. In my experience, the game will take about 30–45 minutes to complete in a single seating. Pocket Egg Race does not contain ads or in-app purchases. The app is available in several languages: English, French, German, Italian, Japanese, Russian, Simplified Chinese, and Spanish. Pocket Egg Race is a simple game with a lot of appeal. It certainly has a unique theme, which I believe will spur interesting discussions within the family. The graphics are cute, and there are many small details which make playing extra fun, such as being able to record a custom cheer for your avatar or tapping the objects on the board to see little animations. More importantly, the app engages kids both physically and mentally through its diverse set of activities. As I’ve mentioned, the games require both a nimble mind and fingers. Kids can also learn a thing or two about patience and taking turns when they play against a friend. Pocket Egg Race is a unique board game that attempts to show kids an egg’s long journey from the farm to the dining table. The learning process is integrated within the game, and kids can participate in 10 mini activities that train both their cognitive and physical skills. Kids can also learn about patience and taking turns as they play the game against a friend. Overall, it’s a great game that I would recommend for kids ages 6–8.